Utilising LED technology in industry lighting means improved light distribution, good visual acuity, colour consistency and optical control, next to less power consumption, less waste, and less time and costs for maintenance. Bright light that feels natural and aids concentration and wakefulness not only improves safety, but also increases worker performance. Good colour rendition enhances visuality, while optimised lighting uniformity and brightness-distribution reduces visual fatigue. REAL TIME SYSTEM MONITORING improves safety by sending alerts and notifications about luminaire lifetime, thus enabling users to solve lighting maintenance very quickly and effectively. In order to collect all relevant data, it monitors the power consumption of the system, of individual luminaires, and luminaire groups, as well as device temperatures. Further benefits: the system is easily accessible from a computer, tablet, or smart phone. 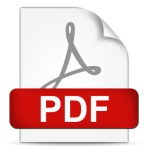 It provides a detailed overview of all information about each luminaire, current settings and measurements. 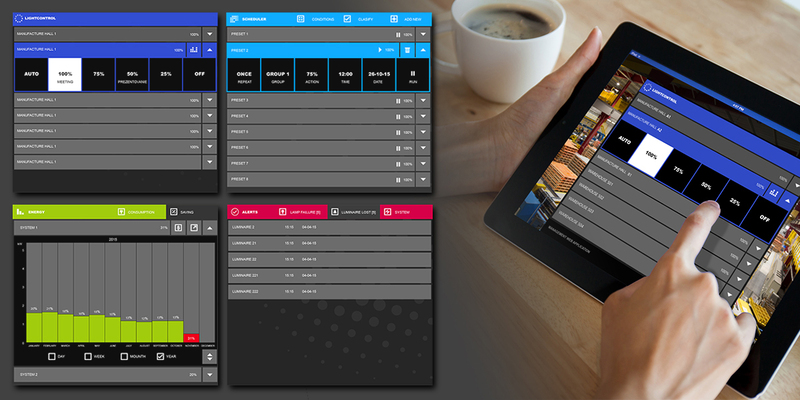 User-friendly remote and local control provides great autonomy. The assessment of energy saving reports can be done easily within minutes. In industrial objects, especially in parking lots, certain warehouse areas, corridors and production lines, there are spaces without permanent use. With control based on movement detection the waste of lighting these unused areas can be eliminated easily. Make use of predesignated functions such as creating zones, time schedule, and setting up delay for dimming to save vast amount of energy. The effectiveness of lighting management based on light intensity sensing is determined by the availability of daylight and illumination rate of a given space. If the situation allows, we recommend the combination of both motion detection and light intensity control. This combined control will provide higher savings than one alone. A modern solution for easy controlling and monitoring of the lighting system in industry applications. The Light Management System (LMS) is controlled through a customised Graphical User Interface that is delivered with each solution. This advanced platform is designed to monitor and manage the system easily. Its key modules make it possible to automatically collect, store and process data, schedule switching, generate reports about the system status and savings, and send notifications about failures and system errors. The software is a reliable and effective tool that helps to reduce operational costs and improve system performance. Continuous lighting lines, mounted parallel with racks provide effective lighting for the visual needs in warehouses with shelves. Point-to-point lighting is ideal for big open spaces and areas where various tasks are carried out next to storage functions, e.g. unloading or loading trucks. These options should be considered when preparing the design of warehouse solutions in order to achieve maximum energy saving levels. It is very important to ensure safety by understanding visual needs as in warehouses it is common to have large discrepancies between light levels of different areas. It takes time for the eyes to adapt to changes in light level, especially when moving from lighter to darker conditions. This causes periods of reduced visual acuity that leads to fatigue and increases the risk of making mistakes and suffering injuries. To apply control with RF system a small antenna is implemented in each luminaire through which data is transmitted in a mesh network topology. Data can be transmitted from different luminaires simultaneously. One of its advantages is that no additional cabling for control is needed. Utilise dimmable, high efficiency LED luminaires with a lifetime of 100.000 hours, a lighting management system that includes motion detector and light intensity sensor, and gain total autonomy. 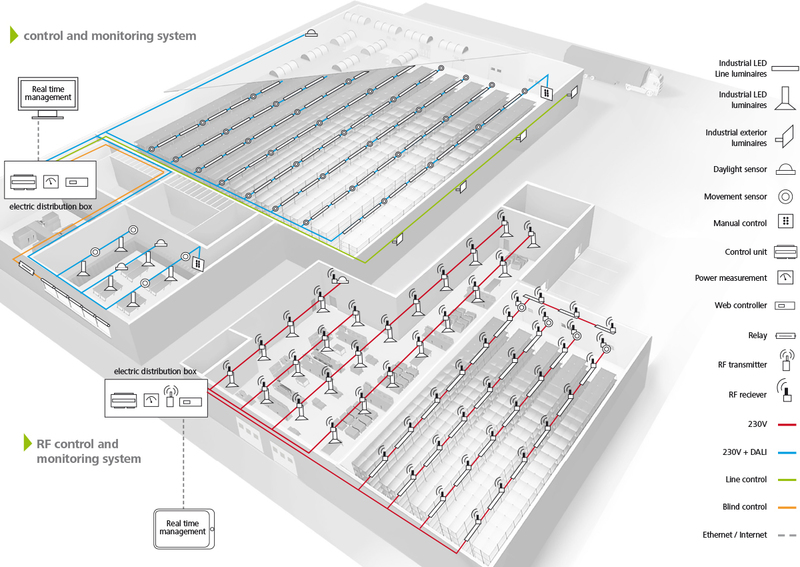 The centralised management system provides management, monitoring of consumption overview, real time savings, real time working paths, and immediate maintenance need signal for ultimate user comfort. 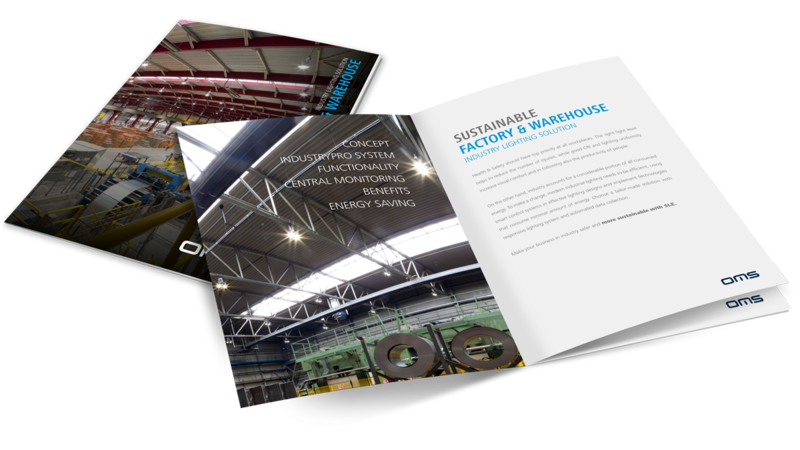 Download our brochure describing the Sustainable Factory and Warehouse lighting solution by OMS in details. Read about the concept, the functionality options, the lighting management system and the benefits of central monitoring. See also real examples for the energy saving potential of industrial lighting solutions by OMS via case studies. With this brochure we would like to help you to choose the right lighting control to maximise the saving potential and improve safety and performance in your plant.